Take 500,000+ recipes (including your own) and your grocery list anywhere on iPhone, iPad, Windows Phone, Kindle Fire and Android. View recipes easily at the grocery store,in your kitchen,on vacation - anywhere! Simply post your favorite recipes to BigOven.com, and you'll have easy access to them on the go from any of the mobile apps. Better still, you'll probably get some good tips and even photos from other users! No awkward cookbooks, splattered recipe cards, or lost printouts. 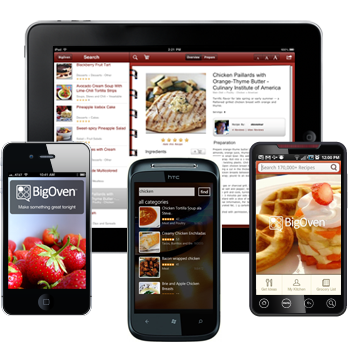 With over 13 million downloads, BigOven is one of the top mobile food apps available. It's the #1 cooking app on Android and Windows Phone, and one of the top cooking apps for iPhone and iPad. Each of our free mobile apps has the unique "Use up Leftovers" feature. Just enter 3 ingredients from your fridge or pantry, and BigOven will show you what you can make! "5 Stars! I am in love with this wonderous phenomenon"
"5 Stars! What a great app! A week before I discovered it I was at the grocery without my list for Pad Thai. I had the hardest time looking through cookbooks there to help me out. I downloaded this app and looked up Pad Thai and instantly there it was! Love this!"